Whilst interesting parallels between the life stories of the two undoubtedly exist, the most important thing they had in common was, perhaps, their moral and civil stance. On 18 May 2005, according to a decree issued by the Ingush president Murat Ziazikov, the first professional Ingush artists Khadzhi-Bekr Akhriev and Gazi-Magomed Dourbekov were posthumously awarded the order "For Services”. Khadzhi-Bekr Akhriev was a pupil at Vladikavkaz college no. 1. between 1904 and 1912. Gaining top marks in subjects such as algebra, technical drawing, art and geography, Akhriev decided to continue his education in Moscow, where he enrolled at the "Arts and Crafts Teaching Studios”. By 1916, he had successfully completed a four-year practical sculpture course and a number of additional art courses. As a student, Akhriev showed himself to be an active enemy of counterrevolutionary forces. 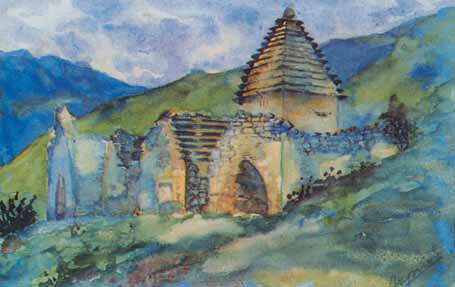 In the early days of Soviet Ingushetia, the first Ingush local history museum was established on Akhriev's initiative. From 1927 onwards, the artist took part in a number of archaeological and ethnographic expeditions. The first professional exhibition in which Khadzhi-Bekr Akhriev participated was in 1931: an important showing leading up to the Mountain Peoples' Olympiad competition. One of the aims of this event was to establish the talents of the various mountain peoples, to help determine the main areas of cultural development for the Transcaucasian republics. Visitors to the exhibition were able to admire Akhriev's "Gorsky [from "gora”, meaning mountain] Republic Sovnarkom in the Mountains. 1919”, "The Ingush Fighting Denikin's Army in 1919”, "Fighting near Surkhakhi and Ekazhevo Villages”, "The Ingush Defending Eben Village in 1830”, "The Collective Farm in the Mountains”, "Women Going to Make Hay”, "View of Znai Aul” (an "aul” being a small mountain village), "Tkhaba-Erdy Temple”, "Making a Carpet”, "The Healing of an Insane” and "Prayers on Stolovaya Mountain”. 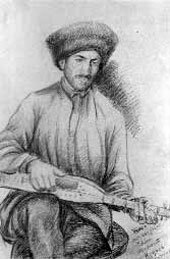 Like the very history of his people, Khadzhi-Bekr Akhriev's creative path was difficult and beset with many obstacles. 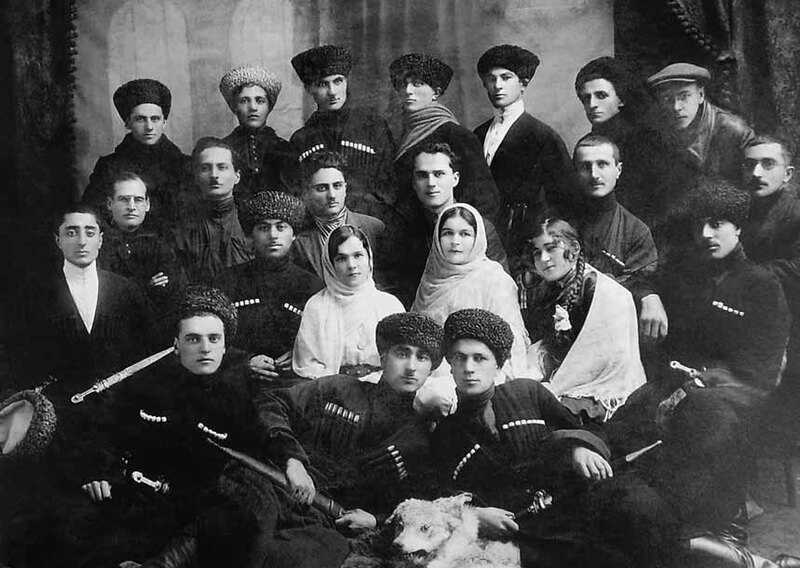 In 1934, the Ingush Autonomous Region was joined to Chechnya. The town of Vladikavkaz, where all Ingushetia's administrative and cultural bodies were located, came under Ossetian jurisdiction, as did Akhriev's and Dourbekov's studios. Indeed, Akhriev succeeded in reviving the craft of the ancient masters, bringing it up to a highly professional level. His skill as a carver is amply proved by numerous ivory and boar's tusk miniatures, the finest and most unusual of which are, perhaps, a powder pot lid with dancing mountain woman and gold-trimmed walrus tusk brooch depicting a female head. The authorities "remembered” Akhriev whenever there was an urgent ideological matter to be accomplished: he received the task of designing a monument in memory of the Ingush warriors killed in the Civil War, and, in 1930, was requested to build a tombstone for the burial of the first secretary of the Communist Party's Ingush Regional Committee, Chernoglaz. A marble obelisk with low reliefs was constructed by Akhriev to mark the spot of Chernoglaz's burial. In 1932, Khadzhi-Bekr Akhriev was made director of the Ingush local history museum. 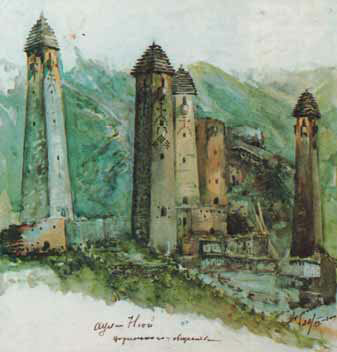 Under his management, the museum became Ingushetia's main centre for academic research. Worthy of special note are Akhriev's military paintings - his studies for "Fighting near Surkhakhi and Ekazhevo Villages” (1931), "The Gorsky Republic Sovnarkom in the Mountains. 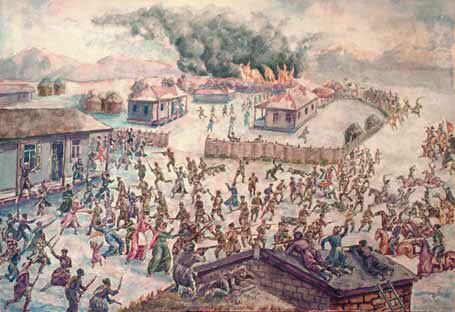 1919”, "The Ingush Fighting Denikin's Army in 1919” and "The Ingush Defending Eben Village in 1830”, as well as the canvas "The Vozdvizhensky Battle”. Having fought in the Civil War, the artist portrayed many of its events in his canvases. 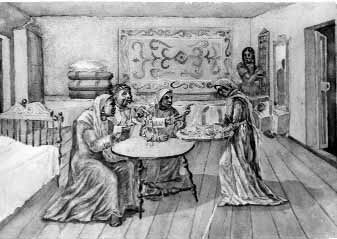 Painted in folkloric style, these are not only works of art, but also Ingush historical documents. Fantastic and, at times, mystical, Akhriev's watercolour landscapes, on the other hand, introduce the viewer to the fairytale world of the artist's imagination. 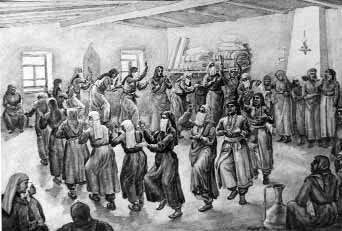 During the period of active Soviet industrial development and the rise of Ingush national art, religious topics were common. "In one of his paintings, the talented Ingush artist Khadzhi-Bekr Akhriev... offers a vivid portrayal of the zikrist's sacred dance,” wrote the archaeologist Leonid Semenov. The painting shows the most common religious rite - the zikr, in which the circular motion of the worshippers symbolises the movement of the sun. In 1934, as the result of false accusations, Akhriev was arrested and sent to work on the construction of the White Sea-Baltic canal. The news of the artist's arrest stunned all those who knew him. Why? was the question which everyone asked, and no one could answer. 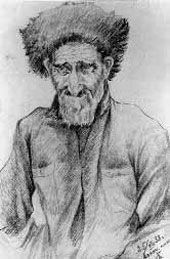 No further information was forthcoming, however, and only in 1962 was Akhriev finally rehabilitated. Gazi-Magomed Dourbekov was more fortunate. Born on 24 March 1904 in Barsuki village, Nazran district, in 1913 he became a pupil of Nazran Gorsky (Mountain) school. Having distinguished himself at school, in 1914 he was admitted to Konstantinovskoye college in Vladikavkaz. In 1924, the Central Executive Committee of the Autonomous Gorsky Republic recommended Dourbekov for study at the Petrograd Higher Art and Technical Institute (Vkhutein), sculpture faculty. 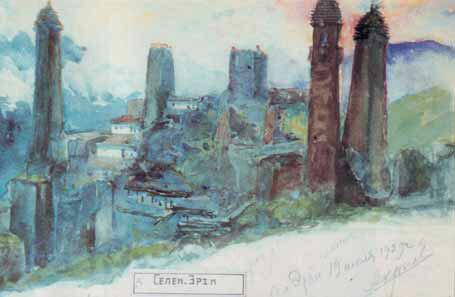 After his first year at Vkhutein, the young man moved to the faculty of painting, where he studied until 1930. An important role in his development as an artist was played by tutors such as the sculptors Vasily Simonov, Matvei Manizer and Vladimir Sherwood, as well as the graphic artist I.G.Ginsburg. Dourbekov strove to develop his gift, experimenting both with style and with medium. Having completed his studies at the institute, in 1930 the artist returned home to take part in the first Mountain Peoples' Arts Olympiad competition. 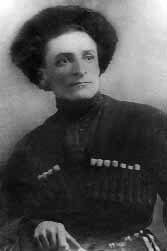 In 1931, Dourbekov became a member of staff at the Ingush museum in Vladikavkaz. Here, he made the acquaintance of the famous archaeologist Leonid Semenov. Together with Semenov, he joined an archaeological expedition, helping to collect ethnographic material. The young artist also found time to make a series of studies of single tone and multi-coloured handmade felt carpets, as well as studies of kitchenware, tools, clothing and the braided wares of the Ingush craftswomen, and sketches of various landmarks. 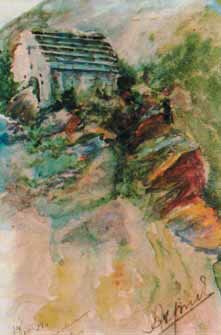 Dourbekov's first paintings as an independent artist were made in watercolour. One of the topics to which he turned was that of surviving religious practices, actively fought by the Soviets. The artist's satirical view of outdated rites found clear expression in paintings such as "Reconciliation of the Blood Feud Enemies”, made in black ink in 1958 and sometimes referred to as "The Blood Feud Enemies' Absolution”, and the watercolour "The Healing of an Insane” (1964). Well versed in the strategy and tactics of the Gorsky (Mountain) fighters, Dourbekov also painted over 20 battle scenes. His "Red Guards with the Ingush”, "The Ingush Partisans' Main Trench by Dolakovsky Cemetery” and "Dolakovsky Battle” are vivid evocations of scenes from the Civil War. 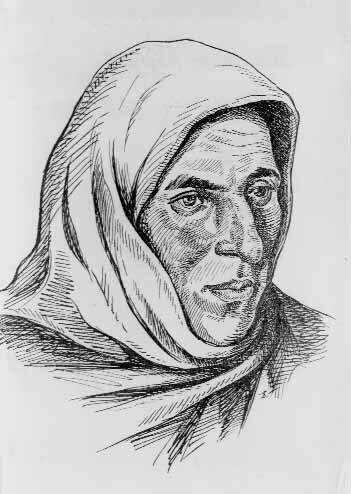 The Ingush are known for their respect for hero-warriors, the lone fighters who became historical figures. Dourbekov's works such as "Sergo Ordzhonikidze” and "Portrait of the Red Partisan Uma Khamurzaev” bear testimony to this admiration. In 1931, in Rostov-on-Don, Gazi-Magomed Dourbekov took part in his first exhibition. This was followed in July 1934 by an exhibition of young artists' work organised by the Komsomol Central Committee and held in Moscow's State History Museum. 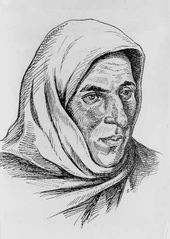 Worthy of particular note are Dourbekov's illustrations for school textbooks, which appeared in Chechnya and Ingushetia until 1944. The artist also produced the illustrations for Daniel Defoe's "Robinson Crusoe”, which appeared in 1954. Upon returning to the Caucasus, the artist took up a position at Grozny's museum of local history. This job made little use of his talents, however. Lacking any other means to make a living, Dourbekov lived and painted in his studio at the museum. 1971 brought the artist an unexpected opportunity to take part in an exhibition of art from the autonomous republics of Russia. Dourbekov was able to contribute not only as an artist, but also as a local history expert and restorer of monuments and folk art. Through his efforts, a number of rare examples of Ingush decorative and applied art were preserved to tell the tale of Chechen and Ingush folk art's development. 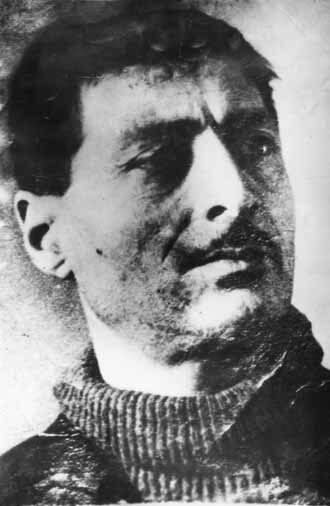 Gazi-Magomed Dourbekov died in 1976. On 24 March 1984, to mark the artist's 80th anniversary, his first and only solo exhibition opened at the Chechen-Ingush local history museum. The legacy of the Ingush professional artists Gazi-Magomed Dourbekov and Khadzhi-Bekr Akhriev serves to show the truth of these words.